Consider a Tuna as an excellent choice for SUP Fit, SUP YOGA, touring, and surfing. An upgrade from the EZ Widers, yet still WIDE and STABLE. Tunas have a deeper deck concave, upgraded deck 3 pc full deck pad for increased versatility , 8 gear tie downs, a camera mount plug, a leash plug, a 3-fin set up for better tracking options. How good is the tuna, well good enough that our Tuna was used in in a paddle fit work out video in Self Magazine. Consider a Tuna as an excellent choice for SUP Fit, SUP YOGA, touring, and surfing. 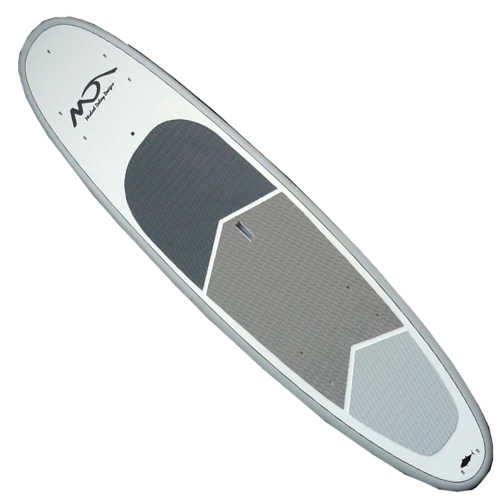 The shape, foiling, width and concave deck make the TUNA a cruiser and a world class all-around performer. A great SUP for all around paddling. EZ Widers are durable, wide, and stable.